Are you looking for a great way to add more information to the media on your computer and keep it better organized? Well if you said yes, then Data Crow is for you. This program not only allows you to enter detailed information about all of your pictures, movies, software and more, but it allows you to organize them for easier viewing. Data Crow is a program that allows you to quickly enter information about the different media on your computer, and organize it for easier navigation. 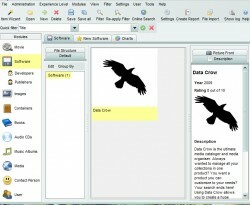 Data Crow has options to help you organize all of your pictures, books, movies, CDs and software. Also, with its online search, most of the time you won’t even have to enter in your own information about different songs, software and movies on your computer. If you have a lot of media on your computer, it could take a LONG time to enter information about all of them. This goes double for personal pictures, which you will have to enter in all of your own information for. Data Crow is a program that can help you add information to all of the media on your computer and organize it better. 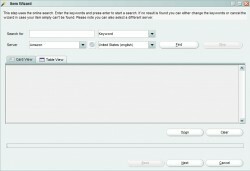 It offers you the ability to keep information about all of the media on your computer in one place. Not only that, but it is able to help you create information about all of your media by pulling information about the media from online sites. When you first start up Data Crow, it will ask you to set your experience level. I recommend starting off as a Beginner if you have never used Data Crow. This mode will help you learn the ropes, and show you how to use Data Crow to its full potential. After you learn the program, you can go back and change your level to Advanced. Once you’re all set up, it is time to start adding your media. There are many ways you can go about doing this. For example, you can use their “Item Wizard” or just click on their “Add” button. This will allow you to add movies, music, software, CD’s, ebooks and more. 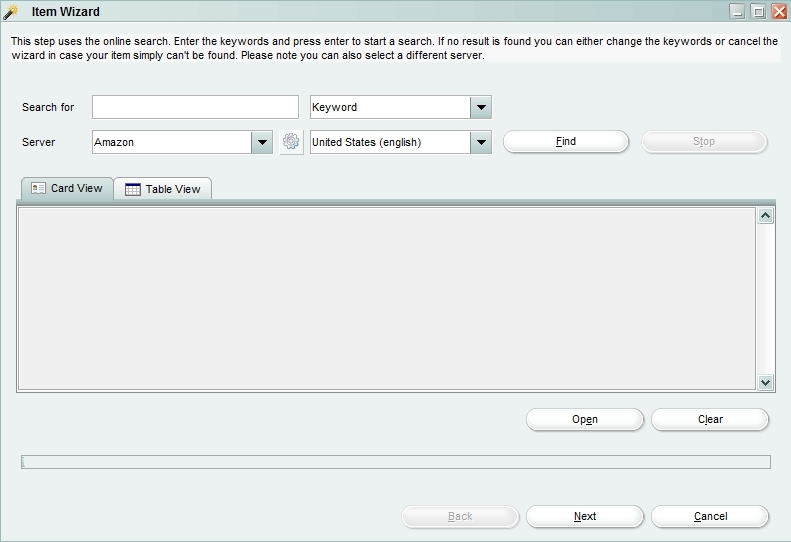 Once you add an item, let’s say software, you can then search online to get information about it. Don’t worry if your program is on the obscure side, I was able to turn up results for a number of programs I assumed it would never find. For example, I have a foreign game on my computer. After having the program search a few sites for it, results started popping up. I was able to choose the one I wanted and add it to my entry. That being said, I did find myself having to cancel the searches a number of times because they were taking too long. I suggest watching the results as they pop up. Once you see the one you want, hit stop and add the information you found. Otherwise, you may be waiting a while for the search to finish. Data Crow is able to search sites like Amazon, Imdb, Softpedia, MobyGames and more. It also gives you the ability to import file information from media, like mp3 and xvid. This will save you a bit of time if you have already filled out the information before. Of course, if you have a lot of media on your computer, it is going to take a while to get it all uploaded onto Data Crow. If you’re looking for a new way to organize your media and add new information about it, Data Crow is for you. Just don’t expect to sit down and have all of your media tagged, filled out and ready to go in a few minutes. It takes time to get all of the information you can add to your media. This goes double if you have a lot of pictures, because you will have to manually enter it.